HPE NonStop Enterprise Division (NED) is pleased to announce the General Availability of Ported Binaries on HPE Integrity NonStop Servers, Java SE 8 Update 4 (referred in short as NSJ 8 U4) for HPE Integrity Converged NonStop X, HPE Virtualized NonStop X and HPE Virtualized Converged NonStop X Systems. Here are the new features added in the NSJ 8 U4 release. NSJ 8 U4 is based on Oracle Java SE 8 Update 172 (JDK 8u172). It is a certified implementation of the Java SE 8 and implements all application programming interfaces (APIs) and tools that are defined for a headless configuration of Java SE 8. A complete list of Java SE 8 features can be found in http://openjdk.java.net/projects/jdk8/features. For information specific to the new features in NSJ 8 U4 please refer to the Release Notes for Oracle Java SE 8 Updates 151, 152, 161, 162, 171 and 172 at JDK 8 Update Release Notes. Thread pre-emption feature was first introduced in NSJ 7 U2 release. It provided a mechanism for application developers to optimize the performance of their multi-threaded applications by configuring a timer which will guard how long a particular thread is able to use the services of a CPU. In NSJ 8 U4 release the feature is enhanced to make it “dynamic” by employing an algorithm which is based on a set of user configurable parameters. This feature is called Dynamic Thread Pre-emption (or) Dynamic Thread Slicing. The amount of time granted to an application thread can be changed dynamically at run time using the parameters provided by the algorithm. Previously, the time for which a thread was allowed to occupy a CPU was fixed for the entire duration of the execution of the thread. NSJ 8 U4 supports Diffie-Hellman key exchange algorithm prime modulus up to 8192 bits and Digital Signature Algorithm (DSA) key length up to 3072 bits. NSJ 8 U4 brings a new security property namely jceks.key.serialFilter. If this filter is configured, the Java Cryptographic Extensions Key Store (JCEKS) KeyStore uses it during the deserialization of the encrypted Key object stored inside a SecretKeyEntry. If it is not configured or if the filter result is UNDECIDED or if the system property jdk.serialFilter is also supplied, then the filter configured by jdk.serialFilter is consulted. The JCE jurisdiction policy files used by the JDK can now be controlled via a new Security property crypto.policy. If the new Security property (crypto.policy) has been set in the java.security file or is set dynamically using the Security.setProperty() call before the Java Cryptographic Extensions (JCE) framework has been initialized, that setting will be honored. In older releases, JCE jurisdiction files had to be downloaded and installed separately to allow unlimited cryptography to be used by the JDK. The download and install steps are no longer necessary. This release adds support for IETF RFC 7627 - Transport Layer Security (TLS) Session Hash and Extended Master Secret Extension. By setting a new System Property jdk.tls.allowLegacyResumption an application can reject abbreviated handshaking when the session hash and extended master secret extension is not negotiated. By setting another new property jdk.tls.allowLegacyMasterSecret to false, the application can reject new connections that do not support the session hash and extended master secret extension functionality. NSJ 8 U4 brings TZupdater version 2.1.2 which carries IANA time zone data version 2018c. Refer to Timezone Data Versions in the JRE software for details. NSJ 8 U4 is available on the NonStop Scout in NonStop eServices Portal. The NonStop hardware and software requirements for deploying NSJ 8 U4 are listed in the data sheet referred below. Note: The Dynamic Thread Pre-emption feature requires a new version of Posix User Thread Model library (PUT library) which is T1280 L02. This new PUT library version is delivered through L18.08 and later RVU versions as part of the SUT DVD. The user manuals, namely NSJ 8 Programmer’s Reference, NSJ 8 Tools Reference Pages and JToolkit for NSJ 8 Programmer's Reference and API Reference, are available on Hewlett Packard Enterprise Support Center web page. Also refer to the data sheet Ported Binaries on HPE Integrity NonStop Servers, Java SE 8 (NSJ 8) for detailed descriptions of all the features of NSJ 8. HPE NonStop Enterprise Division (NED) is pleased to announce the general availability of HPE NonStop Database Analyzer (NSDA) as a new product on our NonStop portfolio. NSDA offers a new way to analyze, correlate, and visualize your SQL/MX data workload, in real time. With NSDA users can immediately identify what resources are engaged in servicing the database workload and make a more efficient use of them. Business oriented metrics allow for a wider range of users to gain visibility and control of the information that matters to them without requiring specific database knowledge. Dramatic reduction of the time spent on data gathering, correlation, and analysis helps improving agility and speed of execution. Application deployment time is reduced; application outage situations are either quickly identified or prevented. The overall gain in visibility and control challenges the idea that analytics can only be done on a separate copy of the database. HPE NSDA is a leap forward to effortlessly optimize your database workload while seamlessly serving both transactional and analytical requirements. HPE NSDA 1.0 introduces a number of graphical features such as dashboards, heat maps, query lists, “top n” workloads, and health check refreshed with real time data. Most graphical representations allow to drill down to a unique query workload with just a couple clicks. Query statistics and plans are immediately available for any given query. The user can zoom in or out a period of time in a few seconds by just moving a slider on a timeline that can range from a few minutes to months. Historical data is retained in a repository that the user can access to generate reports. The repository is hosted on a separate Linux server and no client s/w is necessary other than pointing your Chrome browser to the secure web page for NSDA on that same server. NSDA is available for all platforms running the Lxx release of the HPE NonStop Operating system. HPE NSDA 1.0 can capture queries executed via the HPE NonStop SQL/MX Connectivity Services (MXCS) interface. HPE NonStop SQL/MX DBS (Database Services) is supported. HPE SQL/MP tables accessed from the SQL/MX engine are also supported. Please refer to the datasheet for a more detailed list of requirements. Recorded training and presentations are available in WW Presales TekTalk Home Page (after Jan 30th 2019) and NonStop University Media Library for HPE internal users. For customers not yet familiar with either Linux or SQL/MX or both we recommend to add a professional service to get NSDA installed and setup to monitor your SQL/MX workload. Please contact your sales representative for more information. What specifications should the underlying hardware and virtualization environment meet in order to host a Virtualized NonStop software stack? What rules should I comply with while deploying a Virtualized NonStop system on that environment? As you may know, with Virtualized NonStop, you now have several different options to choose from while implementing the solution. The document is intended to help an Enterprise IT architect design the solution that meets vNS requirements while also complying with the IT policies and practices in the target environment. Please send any feedback/comments to p.kamath@hpe.com. HPE NonStop Enterprise Division (NED) is pleased to announce the General Availability of L19.03 RVU for HPE Integrity NonStop X systems, HPE Virtualized NonStop systems and HPE Virtualized Converged NonStop systems. The following sections summarize the key enhancements supported in this RVU. A separate announcement will be sent on the hardware enhancements supported in this RVU. Deployment tools automate resource discovery for system deployment and optimize some of the deployment tasks such as storage provisioning. vNS fabric is now supported on 25 GbE networks, in addition to the currently supported 40 GbE networks. vNS High End systems support up to 256 GB of memory per CPU. OSS read and write APIs now support I/O sizes up to 868 KB on regular files. These APIs are usable in Pthreads (PUT) processes and non-threaded processes. Guardian File System APIs are enhanced to support transfer size of up to 2MB for inter-process communication. A new API, PUT_TMF_JOIN(), allows a user thread to participate in a transaction initiated by another process. PEEK utility is enhanced to display information related to TMF transactions. OSM Service Connection and OSM Console Tools are enhanced to support Java 11.0.1. OSM Service Connection is also enhanced to report system inventory through a periodic IR. An alternative method is now available to link native DLLs to TNS programs. Binder commands now allow you to embed the name of a user-provided DLL in a TNS object file. NonStop In-Memory Cache (NSIMC) product is upgraded to Redis open source version 4.0.11. NSIMC is now included in the NonStop OS bundle. The common runtime environment has been enhanced with a new heap manager. The new heap manager provides faster performance for C/C++ in-memory computing applications. An example is the NonStop In-Memory Cache product. Applications can choose either to use the existing heap manager or this new heap manager. The default continues to be the existing heap manager. The new heap manager is available only for 64 bit applications on OSS. Run SAFECOM and SAFEART processes in high PIN by default. The version of OpenSSL used in NonStop SSL has been updated to 1.1.0j. This introduces few new cipher suites and deprecates few others. The RELOAD CERTIFICATES command now handles client certificates in addition to server certificates. The default values of the main algorithm parameters have been changed to only include stronger algorithms. You can now configure the permission mode for files uploaded to a peer host using SFTP or SFTPAPI. This is not a complete or exhaustive list of enhancements in this RVU. Please refer to “L19.03 Release Version Update Compendium” and the product user manuals, available at www.hpe.com/info/nonstop-ldocs, for more information on the release content (please allow 48 hours for the manuals to be published at the above portal). SUT requests can be submitted through Scout for NonStop servers, which can be accessed via the HPE NonStop eServices Portal. You may also query the complete list of product versions and software product revisions (SPRs) included in the RVU and download the required SPRs from this portal. HPE NonStop Enterprise Division (NED) is pleased to announce the General Availability of HPE NonStop In-Memory Cache 4.0 (referred in short as NSIMC 4.0) for HPE Integrity NonStop, Virtualized NonStop and Virtualized Converged NonStop systems. NSIMC is an in-memory storage server that applications can use for fast data access. NSIMC can be accessed across CPUs. Hence applications deployed on different CPUs can share data among themselves using the NSIMC without having to exchange inter-process messages between each other. NSIMC 4.0 is a value added port of the open source in memory data store from Redis 4.0.11. Redis is a popular NoSQL data structure store used by applications across many different domains. NSIMC offers all the features of Redis 4.0.11 and with NonStop fundamentals. It is built with the continuous availability and data consistency that NonStop customers have come to expect. NSIMC works in a client – server model. Applications act as clients to invoke commands on the NSIMC server for storing, modifying and retrieving data elements. HPE NSIMC supports several data structures and is resilient to single point of failures. It is capable of automatic eviction of old or stale elements and has the ability to persist data elements in the disk. It also provides master-slave data replication and offers a scripting facility. It scales using a mechanism called client sharding. NSIMC 2.8 offered Least Recently Used (LRU) algorithm for evicting old and stale data elements from the cache so that new elements can be accommodated within its pre-allocated memory area. NSIMC 4.0 adds the LFU algorithm. Both methods provide configurable parameters for the users to tune the respective algorithms as per their need. Modules are run time libraries that can contain custom data types and commands that can be attached to the core NSIMC 4.0 server. The NSIMC 4.0 server will invoke the module as necessary when it is processing commands received from the client application and return the result that was obtained from the module back to the client. Modules are loaded on to the backup NSIMC 4.0 server in NonStop Process Pair mode and hence inherit the same availability and data integrity as the core NSIMC server process they are attached to. NSIMC 4.0 also brings a new data structure, namely GeoSpatial. Applications can store objects using this data type and directly query for results like distance between two points on earth. NSIMC supports scalability of the cache server, i.e. dynamically increase the amount of data that can be stored, by a mechanism of data partitioning called client sharding. Clients that are capable of “client-side sharding” functionality can be configured to use multiple instances of the NSIMC server to store their temporary data thus distributing their data elements across. The NSIMC 4.0 product is offered for the NonStop server without charge. It is included as part of all L-series SUTs from the L19.03 RVU onwards. Please look for the T-number T1300 L01^ AAD. A user manual, NonStop In-Memory Cache User Guide, is available on Hewlett Packard Enterprise Support Center web page. All features of NSIMC 4.0 are described in detail in the HPE NonStop In-Memory Cache Datasheet available here. HPE NonStop. For industries that never stop. The HPE Virtualized NonStop (vNS) system introduces a whole new way of implementing HPE NonStop solutions in today’s enterprise IT. It allows the ability to deploy an HPE NonStop system as a guest in a virtualized IT infrastructure or in a private cloud environment. This opens up the implementation choices for HPE NonStop solutions to a wide variety of hardware products available in the market. To support HPE NonStop fundamentals of high availability, scalability, and security, Hewlett Packard Enterprise requires the virtualized hardware environment to meet a set of rules so that the HPE vNS system offers the same features and benefits as available in the HPE NonStop converged system (HPE NonStop X). This document describes the requirements and rules for deploying an HPE vNS system in a virtualized environment. The document is intended to help customers prepare the underlying environment and deploy HPE vNS systems in compliance to these rules and guidelines. 1. Specify the hardware components (such as server, storage, networking, and connectivity) of the infrastructure eligible to host an HPE vNS system in a generic fashion. 2. State the rules governing the distribution and configuration of HPE vNS virtual machines (VMs) on the virtualized hosts. 3. Provide information about hardware configurations that HPE vNS has been implemented on. This is essentially a reference to the readers of a HPE vNS system implementation in order to help them design systems for their specific requirements. 4. This document covers only the VMware® based virtualization environment. This is a live document and will get updated periodically. The latest version of this document is available for download at hpe.com/info/nonstop-ldocs. At HPE Discover 2018 Las Vegas this year, HPE held their first ever hackathon for customers in a Hack Shack located in the event showcase. The goal of the hackathon was to promote innovation through open source collaboration. During the 3-day event, over 280 people experienced the HPE Hack Shack. They entered a large workspace with slated wood walls containing 10 tables, chairs, and computers available for hacking – all complete with a mood lighting disco ball and background music. A backyard recreational area was also provided (just for hanging out) complete with Astroturf grass, swings, video games, a giant Jenga tower, and a Corn Hole game. Seventy-three enthusiastic would-be hackers sat down for one of five two-hour sessions to test their coding chops. The participants’ skills ranged from absolute beginner to intermediate levels. All participants received a coveted HPE DEV T-shirt. And one talented and creative hacker secured the grand prize of a DJI Mavic Air Drone with accessories. Second place received a DJI Spark drone with accessories. Amazon Echo Dots were also awarded to top finishers. But you did need a willingness to learn. Because no coding talents were required, even novices participated…and did well! Hackathons are a fun way to learn software development and coding skills—and the first ever HPE Discover hackathon delivered. Participants were able to tap into skills that helped them better understand infrastructure as code, a great skill to have in this market. 7. Most common reaction of participants: Shock and awe-some! 6. Top question asked: Where’s the beer? As esteemed hosts, the HPE DEV team saved it for the end, knowing all hackathons end well with a beer. Besides, you don’t win friends (or hackathons) over salad. Who doesn’t love an adorable puppy – even if he is a statue? Sir Hackington Appbuilder III will be attending all upcoming hackathons, as he is now the HPE DEV team’s official mascot. Congratulations to Michael Lai who participated in the HPE OneView detect infrastructure failures hack. He created a server profile from a template and applied it to a server hardware. He then created an alert resource to monitor the server profile. A script runs every 10 seconds, which monitors the status and sends a status alert to the user. 3. HPE loves Open Source and sharing! The winner’s script is in a state that can be easily extended and shared with the open source community to monitor infrastructure resources. It’s also something HPE DEV will add as an example to the SDKs – along with other hacks. To learn more, check out the HPE Developer Community (@HPE_DevCom). As the first-ever HPE Discover Hackathon, the HPE DEV team wasn’t really sure what attendees would think. The “Hello World” hack was eagerly embraced; beginners really do want to learn something new. And in today’s software-defined data center, the magic of coding is a great new skill to develop, and HPE DEV is here to help you grow your skills. Everyone had a great time and will definitely come back for future Discover Hackathons. The HPE DEV team is already brainstorming creative and fun challenges for the next one! The HPE Developer Community connects you with HPE experts, resources and other developers worldwide to help you improve automation, service delivery, and workflow assets using open source software on HPE platforms and solutions. If you are interested in learning more or participating in a future HPE Hackathon, please reach out to HPE DEV on SLACK. The work completed by all of the teams during the hackathon will be leveraged by the HPE Developer Community (@HPE_DevCom). More information about these projects and many others will be available in upcoming articles on the community’s blog site. Technology companies of all sizes — from nascent startups to large enterprises — strive to differentiate product lines and maintain an edge over the competition. In an upcoming book, “The 1st Mover,” author and tech expert Tom Bradicich provides insights into processes that have proven to deliver differentiated product categories for large organizations. Bradicich spoke with John Furrier (@furrier), host of theCUBE, SiliconANGLE Media’s mobile livestreaming studio, at theCUBE’s studio in Palo Alto, California. They discussed the thought processes and proven approaches to driving differentiation in technology products. Validation of the product concept with potential customers is important to ensure innovation is moving in the right direction. When engaging with customers, however, the line of questioning needs to be forward-thinking rather than focused on current competitive solutions, according to Bradicich. “I hear this all the time from my competitors and even some colleagues out in the industry: ‘Well, we ask them what apps they run at the edge. We ask them what they do at the edge.’ That’s good, that’s necessary but not sufficient,” Bradicich said. When speaking with different stakeholders about new products or services, it’s also critical to establish core operating principles early on. This prevents the team from changing directions too frequently or dramatically by providing a true north to which all feedback can be referenced to, according to Bradicich. Bradicich is applying these fundamental principles within his organization at HPE. The Edgeline product team, for instance, is delivering differentiated products in edge computing for a wide range of industrial applications while remaining aligned to HPE’s core compute operating principles. Watch the complete video interview below, and be sure to check out more of SiliconANGLE’s and theCUBE’s CUBE Conversations. HPE Recovery Manager Central is software that integrates 3PAR storage with StoreOnce backup systems to provide a converged data protection solution. It combines the performance of snapshots with the protection of a backup. In this ChalkTalk, HPEStorageGuy Calvin Zito gives an overview. In 2018, we use Hybrid IT to deliver, enable and facilitate organisational and business-driven outcomes. Yet organisations differ over whether they prefer ITIL or DevOps to support their fast-changing IT environments. The amount of focus applied to each will depend on several factors, not least “what are the business or organisational outcomes you are trying to achieve?” In reality, you should consider both to be practical parts of your IT Management System and IT Operating Model. This webinar will look at ITIL, DevOps and other compontments, and why it’s time to embrace multiple tools and methodologies in Hybrid IT. Are you curious about how RESTful Web services can help open up your NonStop to a variety of applications, including modern ones like the Amazon Echo? In our latest webinar, you can learn all about how to integrate your NonStop applications with REST Web services, bringing the full benefit of public and private services into your NonStop applications through several demonstrations of NuWave’s LightWave product suite. Register for the "REST Services in Action: Using RESTful APIs with HPE NonStop Applications" webinar today. We are offering three different times for you convenience. Americas: Wednesday, February 14th, 3:00pm EDT (12:00pm PST). Europe & Africa: Thursday, February 15th, 11:00 GMT (12:00 CET). Asia & West Pacific: Thursday, February 15th, 13:00 AEDT (Sydney), 11:00 JST (Tokyo), 10:00 SGT (Singapore). Now available, the new HPE Developer Community is a place where members can interact with HPE’s new open-source community and create innovative solutions to complex problems by collaborating with like-minded coders. Through this new software community, HPE is enabling thousands of developers to co-develop solutions using Open Source, DevOps and ITOps tools they are already familiar with to implement developer-centric, software-defined and hybrid IT applications. The community allows members to build improved integrations with software that deliver uninterrupted product workflow to the business. Q: Tell me about this new community on HPE.com. A: Today HPE has launched a new developer community program with the strategic objective to improve the developer experience and increase their productivity in the new world of multi-cloud and hybrid IT. This new developer community offers a new, built from the ground up platform that allows developers to collaborate directly with HPE engineers and developers to build cutting edge applications and solve complex technology integration problems. Q: What types of developers is HPE attracting? A: The new HPE developer community focuses the following types of developers. 1) Cloud native application developer who expect a consistent development experience across different cloud environments. This developer wants the necessary tools and services that enable them to focus entirely on developing products instead of worrying about infrastructure and cloud management. 2) ITOps developer who develops integration between ITSM tools and automating infrastructure management, monitoring and lifecycle. 3) DevOps engineer who is developing, improving and executing CI/CD methodologies using tools such as Chef, Puppet, Ansible and more. 4) Developers who are building applications, tools, products and services using OpenSource technologies such as Kubernetes. 5) Partner developers who are working with HPE to support developers mentioned here and building integrations with HPE technologies to improve developer experience. Q: What makes this community different from other communities? A: The HPE Developer Community provides a platform for developers, HPE partners and HPE engineers to have an aggregated view of all OpenSource and other projects HPE is contributing to and collaborating with developers and partners to build solutions to key user issues. The new community also provides a platform where developers, HPE partners and HPE engineers can work on building exciting applications and products together. And, it provides APIs, blogs, training and documentation to help external developers learn and enhance their skills and capabilities to build products and services. Q: Why is this type of community important to developers? 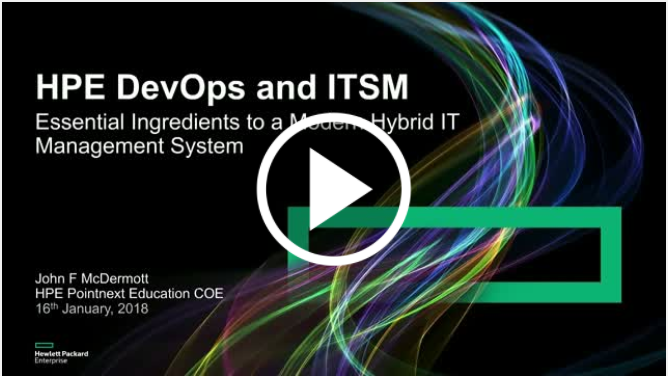 A: HPE views developer enablement as a fundamental part of the company’s hybrid IT strategy. Helping developers build products and solutions is key to our success which is why we are launching the New PAN-HPE Developer Community Program with concrete governance and collaboration model with participation across all areas of HPE. The driving force behind this effort is our multi-cloud and hybrid cloud strategy with HPE OneSphere at the center of developer enablement. Q: Is the community flexible enough for users to add their own areas of interest? A: Absolutely! Within the projects HPE is contributing to and participating in, anyone can begin contributing via GitHub and Slack. Q: When does the community launch? A: Join the conversation now at https://www.labs.hpe.com/slack and on November 28th, visit developer.HPE.com to join the new community! For more details on the new HPE Developer Community, click here. Atmosphere is back in Vegas! Join the best in the industry at Atmosphere 2018 in Las Vegas and be part of today's leading innovation machine! Get ready to learn, collaborate and influence the direction of Aruba products that deliver enterprise-class wireless, wired, security, location and branch solutions. You and over 3,000 of your peers will experience how you can enable intelligent edge capabilities with the Aruba Mobile First Architecture. Need more convincing? Check out highlights from Atmosphere 2017! © Copyright 2017 Hewlett Packard Enterprise Development LP. The information contained herein is subject to change without notice. HPE Nimble Storage Moving Day Is Here! UPDATE (31 October): The Twitter account switch has happened. Your action is to go to @HPE_Storage and make sure you are following it. Also, the migration of NimbleConnect to hpe.com completed today. Read the details below. All organizations, no matter how large or small, are leveraging virtualization and the cloud to meet the speed and agility needs of today’s businesses. But it comes with challenges. Is the worry of protecting your organization’s critical data keeping you up at night? Wondering how to secure the data in your virtual environments? Join this live panel discussion to find out how ZaneRay, a Montana-based web design and e-commerce consultancy, protects their high-value websites, internal systems and client data. Learn best practices for VM backup from practitioners just like you! eCube Systems will kick off an international tour featuring OpenVMS modernization seminars in Europe and North America. eCube Systems in conjunction with Connect is pleased to announce its schedule for the OpenVMS Modernization Seminar series this fall. Each seminar will feature expert directed labs where students follow steps to install and use desktop tools for modernization, a connection to an AVTware Virtual Server running OpenVMS and a 90 day evaluation license of the three modernization tools featured in the seminar for each student. BOLTON, MA, July 10, 2017 – VMS Software, Inc. (VSI) today announced the immediate availability of the production release of VSI OpenVMS Alpha V8.4-2L2 Performance Release for select Alpha hardware platforms, including Alphas emulated on x86-based hardware. This release has been optimized for the DEC Alpha hardware platform running Alpha EV6 and later processors. “This release of VSI OpenVMS Alpha V8.4-2L2 is our 5th release since VSI took over new development of OpenVMS. Like VSI OpenVMS Alpha V8.4-2L1, released earlier this year, the V8.4-2L2 release continues VSI’s commitment to provide OpenVMS installed-base customers with a clear upgrade path to modern x86 hardware.” said Terry R. Holmes, VP Sales & Marketing of VMS Software, Inc. The new release is functionally identical to VSI’s initial OpenVMS Alpha release (V8.4-2L1). It will also be bundled with VSI’s “best-in-class” support. However, for customers running Alpha hardware on EV6 and later processors, the new, optimized V8.4-2L2 release may realize significant performance improvements. “Depending on the specific CPU and operating system features a customer’s application uses, the new Alpha V8.4-2L2 release could render performance improvements of between 15% and 50%. We have also observed RMS image sizes reduced by more than 270 blocks, due to more efficient code generation,” said Eddie Orcutt, VP Software Engineering of VMS Software, Inc.
VSI OpenVMS Alpha V8.4-2L2 includes a full suite of VSI OpenVMS Alpha layered products and open source applications. After a worthy start at the NonStop Technical Boot Camp in San Jose, NSU40 is still going strong, having had its most recent meeting in London at the eBITUG conference. Jimmy Treybig, founder of Tandem Computers, attended the NSU40 meeting in London and stressed, among other things, how NonStop should be presented as a solution and not a technology. It was great advice to a group that is looking for new ways to market the solution to the next generation. The meeting was a success with the entire Board present to take feedback from the room and promote discussion. Besides the eBITUG meeting and the website going up (www.NSU40.com) several months ago, the group is starting to produce educational videos as a way to modernize the current NonStop educational resources. The first one will be a simple intro to NonStop and is expected to debut over the summer. Another idea the group is looking into is a NonStop Hackathon as a way to get people outside the NonStop world exposed to NonStop technology, and promote new ideas on the platform. Details of this are in the early stages but expect to see more information very soon. More news to come at a later time but if you have not done so already, please register at the website, www.NSU40.com, to share ideas on the forum and get on the mailing list! Join HPE and (ISC)2 for an exploration of Data Security in the 3rd part of a three part series. Join HPE and (ISC)2 for an exploration of Data Security in the 2nd part of a three part series.